Each year, come December, there is always much to celebrate; such as the recent National Titles conducted in the UK, New Zealand and Australia, or the upcoming black belt gradings in each country. We also hold Conferences for GKR’s Senior Instructors, spending a few days together to discuss the direction of the club and spending ample time in the Dojo together. In fact, the recent Conferences saw us award some very high Dan gradings to some of our Senior people, whose dedication to both their own journey, along with their students is inspiring. But today I wanted to focus on something rare and special that has recently occurred in the GKR World. Despite the multiple high Dan gradings that took place recently, there is one that truly stands out and I would like to take the time to discuss the Roku (6th) Dan grading of Daniel Tregenza. Daniel has been the Senior Instructor of Adelaide Region 9 (GKR’s oldest Region) since 2004. Of GKR’s current students, it is only my son Matt and Greg Warnest who have trained longer. Daniel’s knowledge, skill, dedication and attitude make him more than worthy of such a grade. 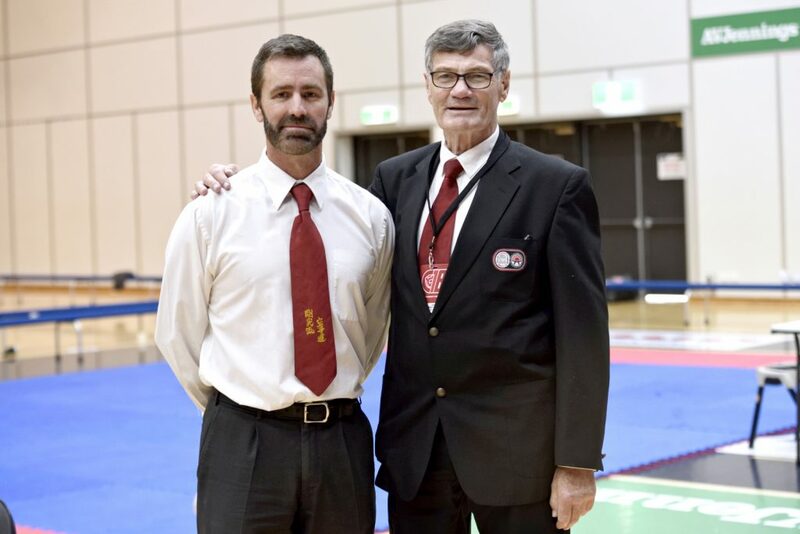 Daniel began his training at Para Hills Dojo in Adelaide in 1986 when he was 14 years old. Over the years he has constantly worked to improve himself and others. The word complacency or comfort zone do not now, nor have ever applied to Daniel. Since I have known him he has constantly worked hard to develop all aspects of his karate (mind, body and spirit). Even today, beyond karate, he regularly competes in cycling events, pushing his body to breaking point, and I’m sure his karate spirit helps him achieve this. – 2 x GKR World Kata Champion (Vets). – 1 x GKR World Kumite Champion (Vets). – 6 x National Kata Champion (both GKR and NAS). – 2 x National Kumite Champion (both GKR and NAS). – 8 x State Kata and Kumite Champion (Opens). – 1 x National Kumite Champion (JKF Open Weight). – Australian Team Member (1994) Koshiki World Titles, Tokyo (full contact point fighting). – Australian Team Member (2008) JKF Nationals in Fukuoka, Japan. – Australian Team Member (2010) JKF Nationals in Takamatsu, Japan. There was much deliberation about granting Daniel a title beyond the regular ‘Sensei’, and awarding him one of ‘Renshi’ (which roughly translates to ‘polished instructor’, but whose meaning extends beyond being ‘polished’). There was no question Daniel was worthy, the only question was, did I wish to bring this title into GKR? When I started GKR I never dreamed of having to make these decisions. I still remember being amazed that we had our first black belt! Years passed and GKR spread, and as such, introducing the title of Shihan became necessary. This too was a huge decision. The term Shihan can be roughly translated as ‘to be a model’. In Japan, it can apply to highly experienced people in various professions (not just the Martial Arts). When Karate arrived on mainland Japan it adopted two systems, the Kyu/Dan grade ranking system, and a parallel system known as Shogo. Shogo roughly translates as ‘Title or Rank’, however ‘Title’ is more accurate. These Shogo (Titles) were only awarded to Dan grades who not only had exceptional skill, but were also exceptional teachers. The Shogo system has three titles, Renshi, Kyoshi and Hanshi. Renshi ‘Polished teacher’ is the first. Kyoshi ‘Expert teacher’ comes next. Hanshi ‘Exemplary teacher’ or often referred to as ‘Professor’ is the highest title one can be bestowed. These Shogo were always completely independent to gradings. In other words, they could be awarded at any time and never coincided with any particular grade. That said, most karate styles the World over have an official grading requirement for them, which varies from style-to-style. Many styles also have a separate belt for these titles, with Red and White stripes or panels, or even a completely Red belt for Hanshi. In case you are wondering if GKR will adopt these other titles in the future, I supposed I would cross that bridge when we came to it, but I have no interest in GKR adopting the various belts associated with them. As there were/are no official rules set out for the Shogo system, we may use them to our discretion as a way of recognising those top-level instructors within GKR. I however have reserved the title of Renshi only for 6th dan and above. It may be of interest to you also that Shihan Gavin Samin’s and Shihan Anthony Ryan’s grading certificates actually note that they are Renshi-Shihan. However we only refer to them as Shihan as it’s a higher title in GKR. I’ve already discussed that introducing the title of Shihan was a big decision for me many years back. Shihan is not part of the Shogo system, and as stated, is even used in fields outside of the Martial Arts (law, medicine, music etc). Amongst Karate styles it’s used even more variably. For GKR, I always intended it as a title for one of our top teachers who not only influenced their own students, but also travelled to impact the students of others. Additionally, people who not only inspired other students, but even other Senior Instructors. The point to all this is that there are no formal rules. These terms are simply titles that styles use to recognize certain instructors. Introducing these titles was just a matter of time and demonstrates GKR’s longevity as a Martial Art. You can imagine when Karate first reached mainland Japan (and every student was a white belt) that it was years before they needed to implement these Shogo or Shihan Titles. However if you train in Japan today, you will find them everywhere. So it excites me to think that from our humble beginnings in Adelaide, that we now have students with decades of training and the necessity for these Titles. I find it even more exciting that one of these is Daniel Tregenza, one of my original students in Adelaide. 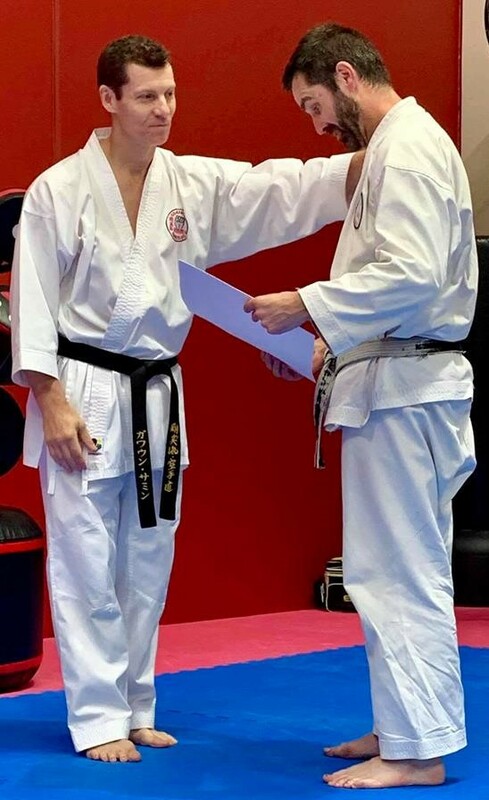 Congratulations Renshi Daniel, and congratulations to all of those Senior Instructors who also graded recently, and for those of you who have an upcoming grading, be it a Kyu or Dan grading, I wish you the very best.